So IFAW is my favorite charity, and this is where I will post their great work and updates on stories about animals they are saving, etc. I hope that it might encourage some of you to donate, as they do so many wonderful things for animals around the world. They save wild animals in distress for any given reason (natural or human caused), like when elephants are hit by trains in India, or when their calves are abandoned or trapped they step in. They save livestock and wild animals and even abandoned pets from natural disaster areas, they work on pet education for countries where the treatment of pets is subpar and they stage vet clinics in developing nations. They save animals from terrible conditions in circuses and deplorable zoos. They work to protect habitats, and fight animal trafficking and poaching. They also provide us with opportunities to sign petitions and write letters to various international governments in efforts to change laws related to animal abuse and animal conservation. They fight against the seal hunt, the dolphin slaughters, dog and cat butcheries, etc etc etc. They do a LOT of good for all of our animal friends who really badly need help. They are also wonderful at keeping donors updated on what they are doing on the ground, and at really explaining the issues and all of things that need to be done to stop them, in very realistic ways. They also have things like ways you can help spread the word, i.e. if you own a business website you can host their banner to try and draw donors. It's a very proactive and well-run charity that I love (obviously, since I'm gushing, lol). So please, think about giving to this wonderful cause! They save wild animals in distress for any given reason (natural or human caused), like when elephants are hit by trains in India, or when their calves are abandoned or trapped they step in. They save livestock and wild animals and even abandoned pets from natural disaster areas, they work on pet education for countries where the treatment of pets is subpar and they stage vet clinics in developing nations. They save animals from terrible conditions in circuses and deplorable zoos. They work to protect habitats, and fight animal trafficking. They also provide us with opportunities to sign petitions and write letters to various international governments in efforts to change laws related to animal abuse. They fight against the seal hunt, the dolphin slaughters, dog and cat butcheries, etc etc etc. They do a LOT of good for all of our animal friends who really badly need help. They are also wonderful and keeping donors updated on what they are doing on the ground. They also have things like ways you can help spread the word, i.e. if you own a business website you can host their banner to try and draw donors. It's a very proactive and well-run charity that I love (obviously, since I'm gushing, lol). These guys. They do amazing work! Our "animal money" goes toward Villalobos Rescue Center and the LASPCA, but I do hope others are able to give to this organization. It all makes a difference for each of them. IFAW regularly partners with other animal welfare organizations, as WH mentioned about the wolf dogs (yay). Here is one example of what they manage to do working with one of their international partners in Bali, and how they tell us personal stories of their work. Saving one cat or dog at a time. "Be A champion to sick and hungry dogs"
It does! And anything given to any of the many animal welfare organizations is amazing. great stuff here. special place in my soul for our furry friends. Split listing, protecting elephants at one level in one place and another level elsewhere, has inherent problems. If you cross this river, your ivory will be worth more than your life! Try telling this to an elephant who is about to cross the national border into a country where his life is at risk just because that government sees big dollar signs on his tusks. Don’t buy this ivory at a lower price. Buy that one because that one is legal. These statements represent rhetorical scenarios at the heart of several proposals that will be debated later this month in South Africa at the conference of the Convention on International Trade in Endangered Species (CITES). To elephants, these scenarios are only too real, ever since the African elephant populations in a few countries were down-graded in 1997 from the higher protection status—Appendix I at CITES to Appendix II, creating what’s called a split-listing of elephant populations from different countries. Split listing, protecting animals at one level in one place and another level elsewhere, has inherent problems. Elephants don’t recognize political borders. Elephants that migrate into the countries where they have less protection have a premium put on their tusks. They are forced to pay for their very existence with ivory. The policy makers in those countries could ask CITES to allow them to put ivory from their elephants onto international markets. Having their elephants on Appendix II made it much easier for these countries—Botswana, Namibia, Zimbabwe and South Africa—to get CITES approval to trade ivory internationally. They have already done so twice in the past 16 years. Two CITES approved “one-off” ivory sales broke the integrity of the international ivory trade ban, and brought catastrophic consequences for elephants. The ivory sales (1999 to Japan and 2009 to China and Japan) from those countries with elephants on Appendix II, especially the second sale in 2009, was the chief culprit for an abrupt, significant, permanent, robust and geographically widespread increase in the production of ivory through elephant poaching, as a new study found. The legal ivory trade supplied by the CITES-approved sales confused consumers and stimulated demand. People who previously had no desire for ivory watched as ivory possession all of a sudden became the trend and a status symbol. I believe a majority of the consumers are law abiding. If the laws prohibit ivory trade, most of them will not actively seek out an illegal substance to purchase. However, a majority of the consumers took market availability of ivory for the legality of trade. They cannot distinguish which country the ivory comes from, whether it comes from legal or illegal sources. They bought ivory trinkets at the lowest price, helping wildlife criminals (illegal traders and smugglers) in making a killing from the illicit trade. The increased demand in Asia stimulated by the sales of ivory from the countries with elephants on Appendix II pushed up ivory prices and fueled elephant poaching across the African continent. While elephants don’t recognize political borders, poachers and smugglers do. Countries plagued by instability, poverty, corruption, and conflict are the criminal syndicate’s favored targets because elephants in these countries are the most vulnerable. New research recently found that forest elephants, whose population had declined by 60 percent since 2002, are closer to extinction than scientists had originally thought. Continental wide, elephant populations are found to be lower than what we had feared. That’s why IFAW supports Proposal 16 by both African and Asian countries to transfer all African elephants from Appendix II to Appendix I.
IFAW supports Doc. 57.2 by ten African elephant range states to close all domestic ivory markets. IFAW strongly opposes Proposal 14 and Proposal 15 to allow possible removal of obstacles paving the way for more international ivory trade. Elephants are the heritage of world. The global community has to all pull our own weight. We cannot just leave the fight of saving elephants to the African countries! Please ask your government to give elephants across African continent equal protection from the menace of ivory trade. Elephants’ survival depends on our action! Say no to captive predator breeding and the canned lion hunting industry. One of the most important outcomes of the recent IUCN World Conservation Congress (WCC) in Hawaii is a motion to end the hunting and breeding of captive bred lions and other predators in South Africa. IFAW has been campaigning for over 15 years to end the cruel and exploitative canned lion hunting industry in South Africa. While there were hints of progress a while back, sparked mainly by public outrage, where the South African Government attempted to ban the industry outright, the South African High Court ruled on constitutional grounds that a ban would negatively impact the livelihoods of the breeders, however uncanny this might seem. We have seen a similar ruling more recently in favour of rhino breeders/ranchers, again where appeals against Government protection measures have been successful. Now, with this recent IUCN motion, the South African Government is going to have to start looking at these issues through a totally different lens. While the South African Constitution has been billed as one of the most progressive in the world, its application has most definitely not benefited conservation and/or animal welfare. Article 24 of the Constitution may well provide a broad basis for environmental protection, but, at the end of the day, a lot is left open to interpretation. The only way to have a positive impact for animals is to influence that interpretation to ultimately benefit individual animals, conservation and environmental justice. The IUCN motion seeks to do that for the approximately 7000 predators caught up in 180 captive breeding facilities in South Africa. Besides the fact that the IUCN motion questions the conservation benefits of the captive predator breeding industry, it also works, perhaps inadvertently, to align conservation and animal welfare ideals. The captive breeding of lions and associated canned lion hunting industry has, in fact, got very little to do with conservation, but a lot more to do with individual animal cruelty. This has been exposed time and time again and recent initiatives such as the documentary, “Blood Lions,” have highlighted this inextricable link. The notion that animal welfare and conservation aren’t at all linked is fast becoming a thing of the past, especially as we are constantly reminded by the graphic imagery in the media of the individual animal cruelty inherent in such conservation dilemmas as rhino and elephant poaching. For IFAW, we maintain that there is a space under the conservation umbrella for individual animals, populations, their habitats, as well as the communities who live with wildlife. With the world watching, the South African Government has sound ammunition through the IUCN motion to do the right thing. I love that this foundation is being so greatly advocated! It just disturbs me to no end that people are selfish and stupid enough to attempt to make pets of. Wild animals. Me too, and what's worse is that they are legally allowed to do so in so many places. The law has to really get in gear when it comes to animal welfare, in so many ways, and so many places, including North America. 16 Dolphins rescued in Cape Cod. Yesterday, the International Fund for Animal Welfare responded a report of six dolphins swimming in Wellfleet, Massachusetts, a global hotspot for mass strandings of dolphins and small whales. The first team on scene discovered not six, but nearly 20 Atlantic white-sided dolphins trapped in shallow water with a receding tide. Soon, 16 animals were left high and dry. With the capacity of a full team and many volunteers responding, our team moved each dolphin from the mud flats on a stretcher using our specially designed dolphin cart. They were staged on the beach to be triaged and prepared for transport to Herring Cove Beach in Provincetown for release into open water. Health assessments revealed that all of the animals were strong enough for release. While two were in guarded condition, given our past success in release, we felt comfortable giving these animals a chance to survive in the wild. Since each trailer can only hold a maximum of five animals, it took us four trips (two for each trailer) to get all of the animals to the release site in Provincetown. It was a well-choreographed dance with teams at each site and in each trailer caring for the animals. 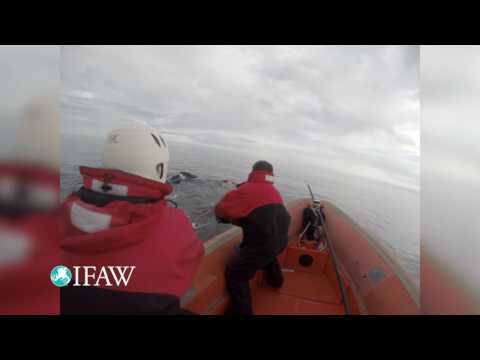 Two animals were released with satellite tags. One has returned to Cape Cod Bay, which is a concern for potential mass stranding. The other is now more than 30 miles north of the Cape. All animals have small yellow dorsal fin tags with our rescue phone number on them. If they are re-sighted at sea or stranded (dead or alive), we ask folks to call our hotline at 508-743-9548. We had great teamwork from our colleagues at the Center for Coastal Studies in our response. We are also very grateful to the National Park Service for assistance at the release site and to the Chequessett Neck Yacht Club for allowing us to stage the response from their property. The public at both the stranding site and release site were incredibly helpful and supportive, and we can’t thank them and our wonderful volunteers enough. "Abuse … torture … malnourishment. These nine dogs have suffered so much in their young lives. But now we have this brief chance to rescue these dogs and give them a new leash on life. Please give now to help them and all the animals that need you. We can’t save them without you." What a beauty (and the shnozz, the shnozz! )...dogs are just amazing, in how they can suffer at the hands of humans/assholes, and still come back with love and loyalty. Update on the 9 Dogs rescued in Lebanon (along with a surprise bonus of 4 special needs cats! ): they are in the USA now and on their way to new homes! Thanks to donations, *hint hint! *, IFAW worked with Animals Lebanon and Sweet Paws Rescue in Massachusetts to save these sweethearts in need. This article has a slide show of them all. My cheeks almost hurt from smiling through that slideshow (and I got shnozzy boy again!). 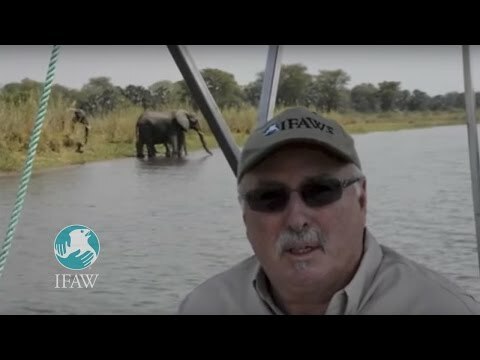 IFAW CEO and President, Azzedine Downes witnesses a herd of elephants at a local watering hole in Malawi (read his story about visiting Malawi to help fight for Elephants at the bottom of this post). Entangled right whale lives to swim another day in the Bay of Fundy thanks to the Campobello Whale Rescue Team. In 2011 I visited Malawi, a very poor country in southern Africa, with a pressing question on my mind: How could I convince local communities that it was in their best interest to protect elephants and other wildlife living in and around Liwonde National Park, a wonderful natural resource? As I flew from the capital city to Liwonde, I was struck by the widespread deforestation below. In fact, it was quite easy to see where the national park began because it was a verdant island in a vastly deforested landscape. I knew that communities living near the national park had not been offered much incentive to see the park, and the wildlife that lived within, as a resource. I know that in other parts of southern Africa communities are offered the paltry leftovers from trophy hunts, and I wanted to find a way for the communities living around Liwonde National Park to meaningfully benefit from wildlife. At IFAW, we believe in the intrinsic value of animals and that means not killing elephants to save them, as is the way in many other countries in the region. The village of Chikolongo, along with many communities that sit outside the park, had suffered many deaths and injuries from human-wildlife conflict, so it was our job to find ways to make the people and the animals safe. I told the village chiefs that IFAW would protect the people of the village whilst at the same time increasing security for the elephants that lived in the park. IFAW helped secure the park by setting up a dedicated fence attendant system aimed at maintaining the integrity of the boundary fence. IFAW worked with the Chikolongo community to help them gain access to water outside the park, as well develop a revenue generation programme (through commercial, cooperative farming) to provide an income stream so they didn’t have to rely on fishing and poaching inside the park. In collaboration with local partner HELP Malawi, we’ve developed curricula for surrounding schools that incorporates the livelihoods work in the region with our animal welfare awareness. As we made our way to the village in a recent trip to Malawi, we found the elephants in this video calmly drinking and socializing along the river. The changes to the village were dramatic. No people had been killed or injured by elephants, and no elephants had been killed by poachers. It is hard to describe my feelings at successfully finding a solution for these animals and people. We hope to bring all the lessons we’ve learned from our success in Liwonde to our new project in Kasungu. I will shortly follow up with more photos and film from our visit but please know one thing: I need you to join me in building a network of people around that world that is committed to supporting projects that keep animals, and the people who protect them, safe. 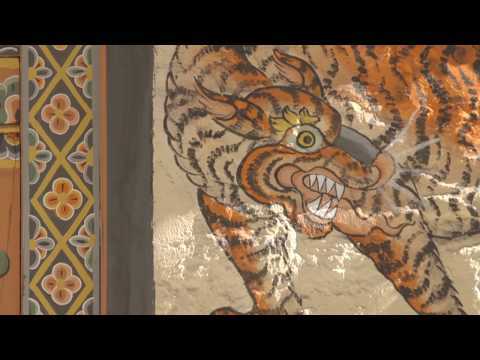 Bhutan is a conservation giant among nations, and the International Fund for Animal Welfare (IFAW) and Wildlife Trust of India (WTI) are proud to have partnered with Bhutan for more than five years to protect its tigers and other wildlife from poaching, illegal trafficking and human-wildlife conflict. Nestled between India and China with our booming populations, Bhutan finds itself a haven for animals seeking to avoid human-wildlife conflict, adapt to habitat loss from climate and elude poachers. Bhutan’s diverse habitats from the snow-capped Himalayas to the lush forests bordering India thus are becoming an extremely threatened landscape, which IFAW has identified as in critical need of protection. Over the past five years, IFAW and WTI have trained and equipped more than 800 frontline staff from 13 different protected areas and territorial divisions, who are now better able to patrol the rugged terrain, address and reduce human-wildlife conflict and detect and deter poachers. We have also trained more than 250 enforcement officers to detect wildlife traffickers across Bhutan. Following on the model project we started in India, together with the Bhutan Department of Forests and Park Services (DoFPS), we have established several Rapid Action Projects, which enable the DoFPS to respond to animal-related emergencies in the communities. These projects are essential for building bridges between wildlife crime enforcers and the people who are living most closely with wildlife—letting people know that we are there to protect them as well. IFAW and WTI are grateful for the willingness of the government of Bhutan and the Department of Forests and Park Services to partner with us on protecting tigers throughout their range. Caracal cats Mavric and Goose were so tiny they still had their umbilical cords attached. A baby duiker, named Anthea, arrived last month when her mother was caught in a snare. A juvenile zebra wandered into a herd of cows, leaving the herder to wonder how a zebra ended up with his livestock. Dotty the leopard cub was discovered by wildlife authorities and brought in for urgent medical care; she was so young her eyes weren’t open yet. Officials think her mother was poisoned by unscrupulous thieves. These are the orphaned animals of Tsavo National Park in Kenya. Big or small, spotted or striped, they are all in desperate need of medical care and rehabilitation before going back to the wild. Tsavo Trust, in close liaison with the Kenya Wildlife Service, has over the last three years been carrying out the process of formally registering the Tsavo Sanctuary as a field-based orphaned and injured small mammal rehab and release site within the Tsavo Conservation Area. Registrations and licensing are now in place and the center is taking in animals needing care. The center will create jobs for the neighboring community and foster business enterprises to supply the center. For example, Tsavo employs five local keepers and goat farms are providing milk for young animals. IFAW and Tsavo Trust have formed a collaboration to develop this center with IFAW providing expertise and funding. Together we will care for Tsavo’s injured and orphaned animals until they are able to take care of themselves and return them to the wild where they belong. No one slept the night Hurricane Matthew passed near Jamaica, dropping rain through high winds lasting through the dawn. The storm’s path changed so often but we kept planning for the direct hit that everyone feared would happen. Jamaica was spared (this time), but we are confident that our colleagues at The Animal House Jamaica will be better prepared next time due to the contingency planning we were able to do together. The day after, we cleaned up debris at the AHJ shelter and checked in with staff and volunteers to make sure everyone was ok. It was a blessing to know that no evacuations or rescues were needed (this time) but we were ready! Even as we gave thanks for Jamaica being spared the direct hit we turned our focus on Haiti and the United States as Hurricane Matthew devastated the island and moved to our homes along the US Eastern Coast. After a full day of assessment, clean-up and daily care we changed our flights to leave Jamaica early and get home to the US ahead of the storm. Ironically as we flew west we had to fly around the storm as it was devastating western Haiti. Thankfully our colleagues with the Christian Veterinary Mission responded quickly and efficiently to help victims of the storm; humans and animals received desperately needed medical supplies and treatment, fresh water and food, temporary shelter. Field assessments took days as roads were destroyed allowing only aerial access to determine the staggering amount of damage. Relief efforts will continue for months if not years. Our team stands ready to support CVM in whatever they need to keep families together during this long recovery period. Just in time, IFAW responders arrived to prepare their homes and families for the worst. Luckily, our team members were spared a direct hit but several suffered flooding and loss of power. Hundreds of thousands of residents along the US coast were not so fortunate. Millions of people were affected in Florida, Georgia, South Carolina and North Carolina. IFAW activated resources immediately to support the National Animal Rescue and Sheltering Coalition (NARSC) in Georgia, South Carolina and North Carolina. The IFAW Disaster Response team deployed to North Carolina with an animal search and rescue team, transport truck and trailer, boats and emergency sheltering supplies. Our assignment took us to Pender County, NC to support the Pender County Animal Shelter. We worked in and out of flooded waters to rescue animals left behind by residents that surely expected to be able to return within a day or two. Now it was a week after the rains began and the rivers flooded into one neighborhood after another. Frantic owners called the PCAS to ask for help to rescue their animals or just try to find them. Even a week after the flooding began 47 percent of the county was still flooded which is catastrophic for infrastructure and greatly delays recovery. Seeing a buck’s antlers sticking out of the water reminded us of the struggle all animals face during natural disasters. In extreme flash flooding like that experienced along the swollen Black River, exhaustion and panic can overcome the strongest of animal. We responded to calls for dogs, cats, horses, pigs and cows. Sometimes we were too late…. For many animals, there was hope. The dog in the picture above chewed through the wire roofing of his kennel and climbed up to avoid the water that quickly rose above his dog house. We rescued dogs and cats stranded on porches, discovered resilient pigs stranded in a submerged trailer, and collected surrendered animals from owners that made the difficult decision to give away their animal(s) in the midst of despair. For many of the larger animals stranded on dry land like horses and cows we evaluated their condition and provided feed and medical care if needed. Everyone that came into the shelter needed a good bath and veterinary exam thanks to the contaminated flood waters and dire living conditions. Warm beds, full bellies, and lots of tender loving care were our main priority. Two stray dogs were stranded together and the one in the picture above even took a nap on PCAS Shelter Director Jewell Horton’s lap during the ride back to our base camp! Owners were able to bring their pets to the PCAS for temporary sheltering which was a blessing for both the owner and the animal. Staff worked hard to not only care for the evacuated animals but all of their wards from before the storm and flooding happened. Horton earned our respect and admiration for how she kept everything together. We are grateful to have been able to serve our colleagues in both Jamaica and the United States these last couple of weeks. And we keep our colleagues in Haiti in our thoughts and prayers as they continue to plan how to best serve the surviving animals and their owners across the island. Natural disasters are increasing all around the world, and we are building capacity internally and with partners to ensure IFAW is ready when needed. And here is a facebook page dedicated to helping this cause: https://www.facebook.com/SavingOurStrays/ Apparently you can volunteer through this group. When enough people make a big enough of a stink, governments often do finally act. It's how change happens. Sometimes it's slow, but slow is better than never. I have been remiss with updates on IFAW lately due to illness and then busy-ness! First of all, an amazing thing just happened, which I'm sure most have already heard of. The Ringling Bros. Circus is finally closing because they will no longer have animal acts! The fact that the circus has to shut down for the welfare of the animals as opposed to just eliminating the animals goes to show how much animal torture helps to put money in people's pockets. This news is particularly good because it is a direct result of the changing attitudes in society when it comes to animal rights..... Now for all the other circuses in the world that have animal acts. The job's not over yet! (btw, in other news, Seaworld would have people believe that they've basically cancelled their whale shows, judging from their press releases. Of course they have NOT. They're just a little pared down. Oh, and RIP Tilikum. You're finally out of your misery). Back to IFAW's direct work. Here is a lovely update on a couple of sweet orphaned elephants. See www.ifaw.org for other updates and to donate. Two elephant calves, rescued in separate incidents, have been admitted to the International Fund for Animal Welfare (IFAW) wildlife rescue centre located near Kaziranga National Park, a cooperative rescue, treatment and rehabilitation facility sponsored and run by IFAW, Wildlife Trust of India and the Assam Forest Department. They were admitted for treatment and long-term care during the past week. A female calf, just about two weeks old, was rescued by forest department personnel from a drain in the Nanoi Tea Garden under the Salna Forest Range. The natal herd was nearby, and a reunion with her herd was attempted. However, the calf was found the next morning, abandoned in the nearby Amlakhi Tea Garden. Given her poor physical condition, the forest department contacted the centre and brought her in. 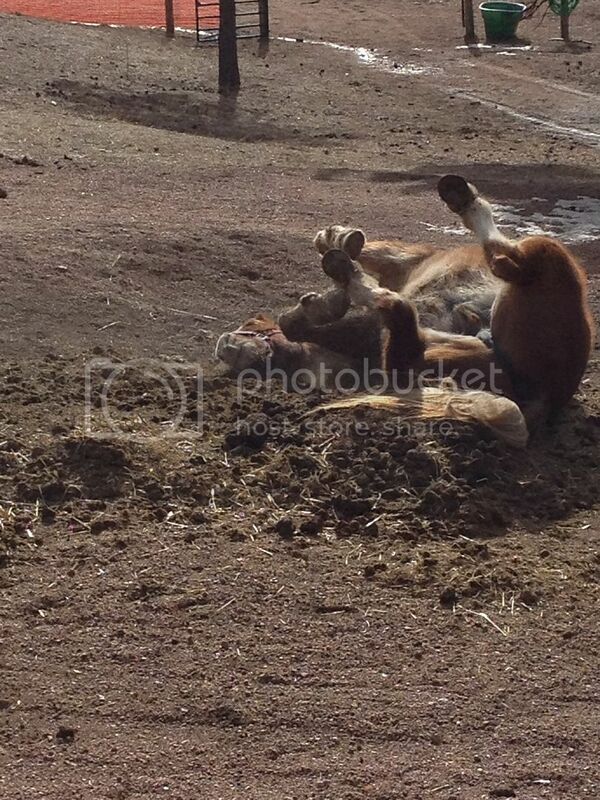 “The calf was very weak and had visible injuries on its navel area and tail. It was in a state of severe trauma,” said Dr Panjit Basumatary, the attending veterinarian. Both calves are currently housed in the centre’s Large Animal Nursery and are closely monitored by staff. The female calf has ventured into her small outdoor paddock and now shows visible signs of improvement. With these two new additions, there are now twelve orphaned elephant calves, three males and nine females. The young elephants are hand-raised at CWRC with the goal of eventual wild rehabilitation.